Let's see some numbers, and some specifics, about promised reforms and reorganization. 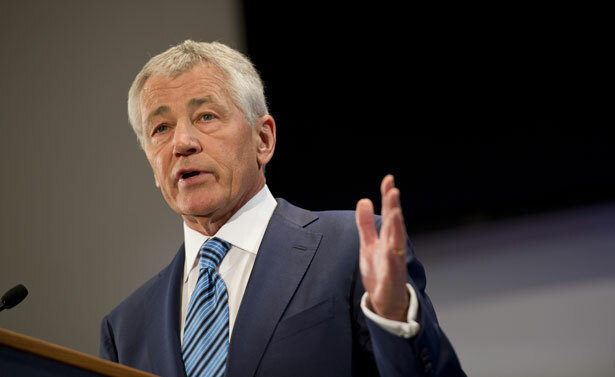 As promised, Secretary of Defense Chuck Hagel delivered his speech on defense policy at National Defense University on Wednesday, and it left a lot to be desired. I’m not sure that most secretaries of defense—certainly not Bob Gates and Leon Panetta, Hagel’s predecessors—would see the budget constraints that face DoD as an “opportunity.” Both warned constantly, and incessantly, that budget cuts at DoD would be some sort of catastrophe, so at least on that score Hagel’s speech was less alarmist and more, well, realist. The threat to US security presented by Hagel was centered on “violent extremism” (i.e., what’s left of the Global War on Terror) which “persists and continues to emanate from weak states and ungoverned spaces in the Middle East and North Africa.” That, plus cyberwarfare and other threats, including “the uncertain implications of environmental degradation,” is what the United States has to worry about. But when he got to budgets, Hagel went off the tracks. Today, he said, the Pentagon has to deal with its challenges “with significantly less resources than the Department has had in the past.” But that’s not true. Yes, the wars in Iraq and Afghanistan are pretty much over, but stripped of the costs of those wars, Pentagon spending hasn’t fallen much if at all—at least not yet. Slashing the bloated DoD budget ought to be Hagel’s, and Obama’s, job during the next four years. The Department of Defense has been preparing for this inevitable downturn in defense budgets, and has taken significant steps to reduce spending and adapt to the new strategic environment. Hagel noted that some reductions here and there are being made because of sequestration, of course. But DoD isn’t worried. It is already clear to me that any serious effort to reform and reshape our defense enterprise must confront the principal drivers of growth in the Department’s base budget—namely acquisitions, personnel costs and overhead. Duh. That’s where the big bucks are: uber-expensive weapons systems, salaries (especially for the top-heavy officer corps, including way, way too many generals), and overhead (including the costly, gold-plated DoD healthcare program). Happily enough, Hagel quoted a former Navy chief saying that DoD could change from “an agency protecting the nation to an agency administering benefit programs.” Indeed, the lingering costs of the $6 trillion wars in Iraq and Afghanistan are centered on health care and pension benefits for veterans, among other items. During this period of budget turmoil, and after a financial crisis and a decade where our country has grown weary of war and skeptical of foreign engagements, questions arise about the merits of America’s global leadership. America does not have the luxury of retrenchment—we have too many global interests at stake, including our security, prosperity and future. If we refuse to lead, something, someone will fill the vacuum. Well, no they won’t. Who, exactly? Russia? China? Not likely. And what “vacuum,” exactly? Nature may abhor a vacuum, but it isn’t the job of the United States to go stumbling into every regional conflict, humanitarian crisis, failed state and would-be terrorist nest that arises. Whatever those things are, they’re not “vacuum” to be filled. Read what Robert Dreyfuss was hoping to hear from Hagel this week.